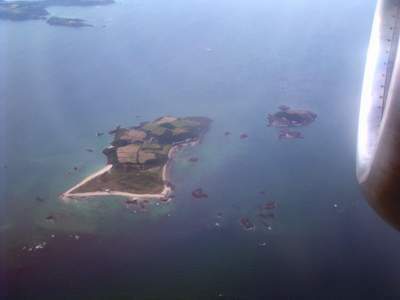 This is the whole island, 31/2 miles x 7 miles, 25 Sq miles, taken from the air. It sits in the Bay of St Malo, France, 85 miles South of England. 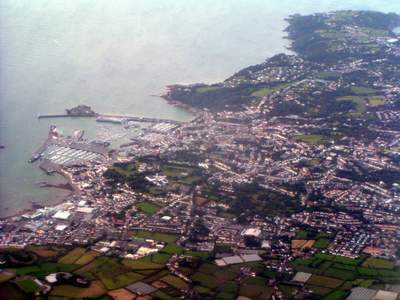 St Peter Port is the main town of the Island and where the harbour is. 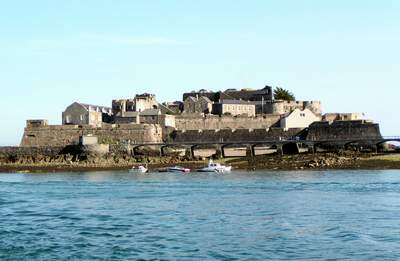 Castle Cornet can be seen in the harbor of this photo. 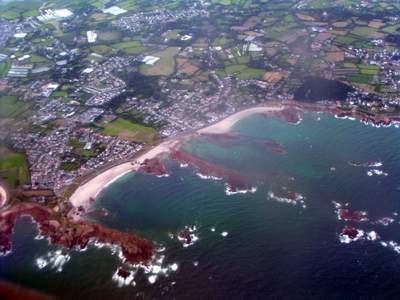 The West coast, Cobo & Saline bays. 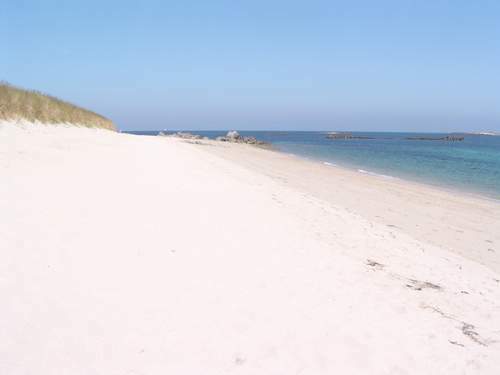 The shores on the North & West side of Guernsey are very flat with wide, sandy beaches. The Sunsets here are beautiful. The South of the island on the other hand has rocky cliffs, hidden coves and great cliff walks. Situated in the harbour of St Peter Port. 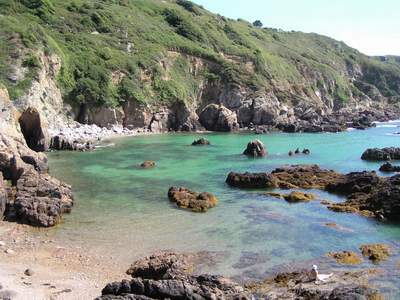 Moulin Huet was a bay loved by Renoir who painted no less than 15 paintings, including several of this bay, during his stay on the island. Who could blame him?! 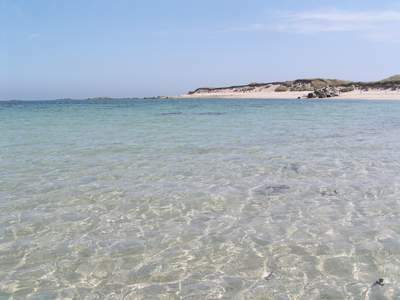 This emerald green bay with its pink granite rocks is also a favorite with children for snorkling & rock pool exploring! 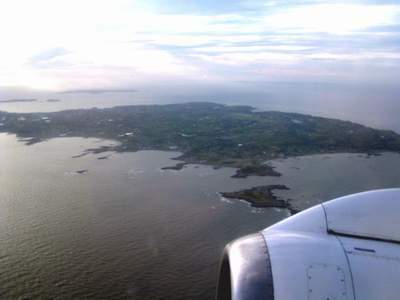 Taken from the air, this photo shows the tiny size of this paradise island with its wonderful "Shell beach". 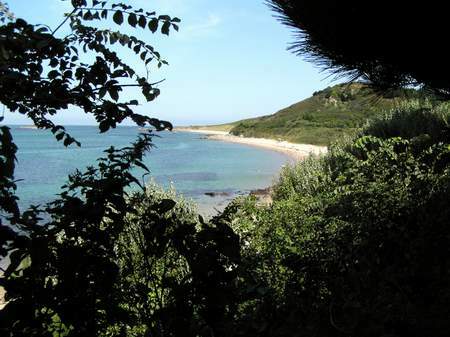 It is 11/2 mile long x 1/2 mile wide and sits just of the coast of Guernsey, about 20 mins by boat. Heaven! The tiny island off to the side is Jethou, which is privately owned. 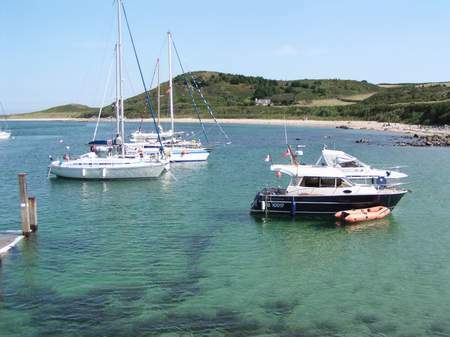 Boats pull into the very pretty harbour of herm. This is the only way to get to the island. There are no cars on Herm, just a few tractors for the farmland there. The island is seen by foot only and only takes an hour or two to walk around the entire island, but most people do it as a day trip, enjoying the islands beauty and taking their time! No one is in a hurry here. With no cars it is a very quiet, relaxing place with just the sound of birds, waves & the tinkling of yacht masts. 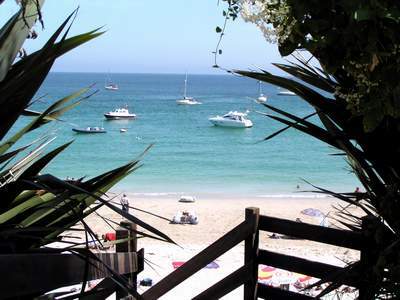 Once you've left the boat you will enter the tiny village of herm with several shops, the "White House Hotel" and the "Mermaid Tavern". From here you can walk the entire perimeter of the island, or cut through the middle to the opposite side a 1/2 mile across which will bring you to Belvoir bay. Shell beach, showing the softest white sand! It is so named because of the amount of shells that are washed up onto its shores by the gulf stream, which passes through these Islands from the gulf of Mexico. It is this gulf stream which gives the Channel Islands such a mild, sub-tropical climate. One of the islands most beautiful beaches with clean sand and clear, turquoise waters. It is very popular with visitors in the summer. Many beaches around the islands have very shallow, sandy areas before dropping off into deeper water. 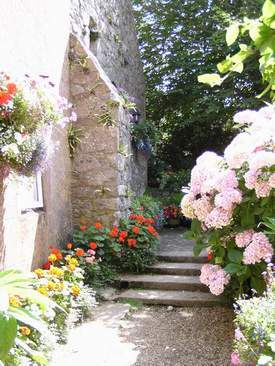 The entrance, full of summer colour, to the islands tiny chapel. 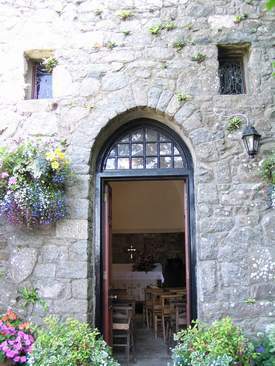 This tiny chapel dates back to the 11th Century. 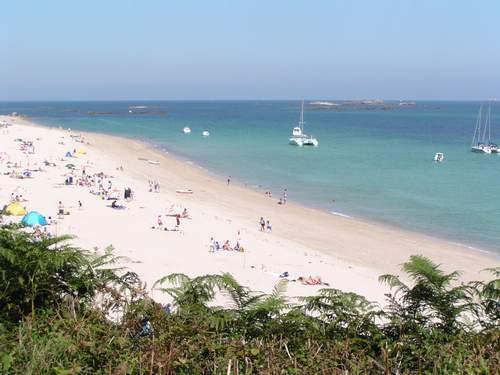 Visitors to Herm usually make a bee line to either Shell beach or Belvoir bay to spend their day. Belvoir bay has its own cafe with a patio overlooking the bay, a good place to stop for ice cream or an English cream tea.